PORT AU PRINCE - An assessment conducted by the United Nations Food and Agriculture Organization (FAO) and the World Food Programme (WFP), together with the Haitian government and its National Coordination for Food Security (CNSA), has determined that, in the wake of Hurricane Matthew, some 1.4 million people are in need of food assistance, 800,000 of whom are in a dire situation. 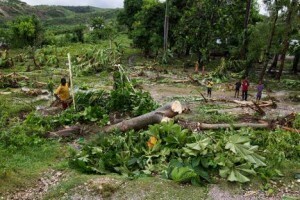 The emergency survey was conducted one week after the Category 4 storm, which devastated supplies and crops across the island. Fifty percent of livestock was lost and agriculture has been virtually wiped out in the Department of Grande-Anse, a department in the southwest. Along the southern coast, fishing has been rendered impossible, as flooding has washed away nets, traps, boats, and engines. Without fishing income, families have no money to buy food. Moreover, in the Department of Sud, just south of Grande-Anse, subsistence crops are gone. Ninety percent of the forest and fruit trees in the department were severely damaged, and the remaining ten percent are unlikely to be productive in the coming season. “Local products on the markets will soon be depleted and we need more funding in order to continue food distributions to help 800,000 people in need of food aid which is more than urgent,” Miguel Barreto, the regional director in Latin America and the Caribbean for WFP, announced in a news release. With the winter crop season approaching, the situation for agricultural producers who have lost everything is desperate. “If we don’t act now to provide them with seed, fertilizer, and other materials they need, they will not be able to plant and will be faced with persisting food insecurity,” urged FAO’s representative in Haiti, Nathanaël Hishamunda. FAO is committed to working with Haiti’s ministry of agriculture in order to implement the emergency response plan, which will focus on helping people resume agricultural activities and improving food security in rural areas. While the southern part of Haiti has seen some of the worst devastation, elsewhere between 60 and 90 percent of crops have been destroyed. In the Department of Artibonite, 60 to 80 percent of livestock were wiped out, and the assessment found a 40 percent trade loss for fishing communities in the Department of Sud-Est. In order to meet the food assistance needs in Haiti, the humanitarian community requires an additional $56 million over the next three months.